The Soviet past taught Minsk that guns and oil are the most powerful instruments for shaping the international politics. Arms transfers to client governments allowed the Soviet Union to recruit allies and expand its strategic influence. Belarusian heavy industry constituted 25 percent of Soviet machine production, and when the Soviet Union collapsed, Minsk started exporting arms independently – only not so much to advance its strategic goals as to simply survive. In 1997, profits from selling the warehouses of the former Soviet Army reached $500 million, securing Belarus ninth place among the world’s ten largest arms exporters. The Soviet Union funded the decades of military and economic aid to allies through millions of barrels of oil exported in petroleum and natural-gas products. Belarus cannot emulate the USSR in this respect because its oil reserves are negligible and it has to import 75% of its oil from Russia. After the Soviet implosion, its deference earned Minsk generous energy subsidies. However, Moscow eventually raised the gas prices and in June 2009 started building a new pipeline, which will cut Belarus from a key supply route to Europe. Last summer, the Kremlin went as far as to stop supplies to Belarus altogether after Minsk had expressed discontent. Chavez’s overtures have come at the time when Belarus is looking to diversify its fuel supplies. On Lukashenka’s visit to Venezuela in 2007, Chavez promised to supply the oil needs of Minsk for years to come and this promise seems close to fulfillment. Venezuela is one of the world's richest countries in oil reserves, which are estimated at 77.7 billion barrels. In return, Belarus will supply weapons and technological expertise. Partnership with Caracas will give Minsk access to South America's defense industry market. Having recently launched a military modernization program, Venezuela is interested in purchasing an anti-aircraft defense and portable missile systems. The two states are also considering joint design and manufacture of new military and technological equipment and transfer of technology. Like Russia, Venezuela is not shy about exploiting energy dependency of its customers. Chavez has already warned of cutting off oil exports, should the United States become aggressive. This matters little to Belarus, however, as Caracas will be less sensitive than Moscow about Lukashenka’s overtures with the European Union. Lukashenka has been seeking closer ties with the European Union and the United States, but made merely cosmetic changes to his behavior at home and abroad. 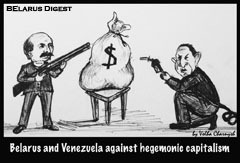 If the marriage of Belarusian arms to Venezuelan oil succeeds, he may change his mind about improving Minsk’s relationship with the West and revert to old ways.